Whether due to a stray cat, a players meeting, a favorable home schedule or something else, the St. Louis Cardinals reeled off an eight-game winning streak that has them in the middle of the Central Division race. Dexter Fowler is the new clean-up hitter and has been cleaning up. 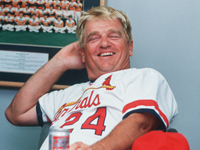 Our history feature looks at the 1987 Cardinals. To those who remember the Rally Squirrel from the 2011 Championship season, this season brings us another “rally” animal to get behind. In Wednesday’s game against the Royals at Busch Stadium, the St. Louis Cardinals were behind the Kansas City Royals by a score of 5-4. In the sixth inning, with two outs and the bases juiced, Yadier Molina came to the plate. After taking the first pitch from Royals reliever Peter Moylan for a ball, Molina backed away and pointed toward the outfield. There, scampering across the outfield, was a kitten. The game was delayed while a member of the grounds crew attempted to remove the kitten. The kitten was removed from the field, but not without putting up a fight with the grounds crew member (who was bitten). When the game continued, Molina immediately hit a grand slam that won the game for the Cardinals. The fate of the kitten was a mish mash of stories. One story was that the kitten was taken to the Humane Society, which turned out to be false. Another one was that the kitten was placed at the Stan Musial statue and mysteriously claimed by a woman, who later supposedly claimed to have lost the kitten. Finally, the kitten was found and delivered to the St. Louis Feral Cat Outreach. It turned out it was not feral at all, just a stray. The cat was given a health check, appeared to be healthy, and will now be quarantined for 10 days and then offered out for adoption. One has the feeling this kitty will be fought over, and hopefully the lucky adopter will be revealed in the next week or two. In the first of a four game home and home series against the Royals, the Cardinals continued their offensive outburst from Sunday’s game against the Reds. The long ball accounted for seven of the Redbirds’ 11 runs. Matt Carpenter hit a three run home run in the fourth inning, Kolten Wong had a two run shot in the eighth, and Paul DeJong added a two run shot in the ninth. 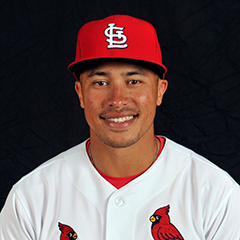 Wong had four RBI as he drove in the first Cardinal run in the second inning on a sac fly, and plated a run in the fourth on a force attempt that resulted in a throwing error. Also in the fourth, Greg Garcia drew a bases loaded walk to score a run. Carpenter was 2-for-4. Jose Martinez was 2-for-5 and Yadier Molina was 2-for-4 with two runs scored. Starter Carlos Martinez pitched eight innings, giving up two runs on seven hits to earn his eighth win. The right hander struck out seven and walked none. Sam Tuivailala pitched the ninth and surrendered one run. In game two of the series, the Redbird bats came to play with the long ball again playing a major role. Yadier Molina hit a solo shot in the fourth inning, and Randal Grichuk added a solo blast in the fifth. Jedd Gyorko blasted a three run shot, also in the fifth. Molina was 2-for-4 and drove in three runs. Grichuk was 2-for-5, and he plated two runs on a single in the seventh. Matt Carpenter had an RBI double in the seventh and was 2-for-3. Paul DeJong was 2-for-5. Starter Michael Wacha pitched six innings, giving up three runs on six hits. The right hander struck out five and walked two to earn his ninth win. Three relievers added a scoreless inning each – Seung-Hwan Oh, Zach Duke and John Brebbia. On the base paths, Gyorko was picked off and caught stealing second base. The Cardinals returned home to Busch to play the Royals in the second half of the home and home series. The Redbirds continued their winning streak by defeating the Royals for the third time. Starter Mike Leake had an indifferent outing, going five innings and giving up five runs, four earned, on 11 hits. The right hander struck out five and walked one. Matt Bowman pitched a scoreless inning of relief and was the winning pitcher. Zach Duke added a scoreless seventh. Seung-Hwan Oh and Tyler Lyons combined for a scoreless eighth, and Trevor Rosenthal tossed a scoreless ninth to earn his ninth save. A grand slam by Yadier Molina in the sixth was the offensive highlight, which occurred with the Cardinals were behind 5-4. After the first pitch to Molina, the catcher pointed to the outfield, as there was a small kitten running across the outfield. The game was halted and the kitten was captured by a member of the grounds crew and carried off the field. The kitten was dubbed the “rally cat” as Molina followed the incident with the grand slam that secured the victory for the Cardinals. Also driving in runs in the game were Mike Leake on a sac bunt in the second, followed by an RBI single by Matt Carpenter. In the third inning, Jedd Gyorko plated a run on a single to left, and in the fourth, Jose Martinez launched a solo home run. Martinez and Grichuk were 2-for-4. On the base paths, Kolten Wong stole his fourth base of the season, and Dexter Fowler stole his fifth base of the season. Wong was also picked off and caught stealing. In the field, Molina committed a throwing error and Fowler had an outfield assist. In the rubber game of the home and home series, the Cardinals accomplished the sweep against the Royals. Like the previous game, this was a come from behind win. The Redbirds were held scoreless until the sixth, when three runs tied the score. Four tallies in the seventh, and one in the eighth gave the Cardinals the lead they wouldn’t relinquish. Dexter Fowler’s double plated the first run in the sixth. A throwing error on Jose Martinez’ ground ball force attempt brought a second run home. Kolten Wong’s sac fly scored another. The grand slam was again prominent, by Fowler in the seventh inning. Paul DeJong’s double in the eighth brought in the final run. Fowler was 2-for-5 with five RBI. DeJong was 2-for-3, and Wong was 2-for-2. Lance Lynn pitched six innings, giving up three runs, two earned, on six hits. The right hander fanned three and walked five. Matt Bowman and Tyler Lyons combined for a scoreless seventh inning. Lyons was the winning pitcher. Brett Cecil surrendered two runs and Seung-Hwan Oh was charged with one, as both pitchers got one out each in the eighth inning. Trevor Rosenthal secured the final four outs for his 10th save. The Cardinals began the weekend series against the Braves with their seventh consecutive win. Adam Wainwright won his 12th game despite subpar velocity. The veteran right hander pitched five innings, giving up one run on four hits. Wainwright walked three but struck out none. Brett Cecil started the sixth and had a tough outing, surrendering four runs and only two outs. John Brebbia got the final out of the inning and two outs in the seventh before Zach Duke retired the next four batters. Matt Bowman pitched a quiet ninth to earn his second save. The Cardinals scored four runs in the second inning, starting with an RBI double from Kolten Wong. Randal Grichuk plated a run on a single. Matt Carpenter and Paul DeJong each doubled in a run. In the third, Grichuk tripled to bring a run home and Wainwright singled in another. DeJong plated two on a double in the eighth for the final two Redbirds runs. DeJong was 2-for-5 with three RBI. Grichuk was 2-for-4 with two driven in and two scored. Yadier Molina stole his eighth base of the season. The Cardinals edged the Braves in the second game of weekend series. Dexter Fowler got St. Louis on the board in the first inning on an RBI single to right. In the second inning, Randal Grichuk’s solo home run added another. Three runs came home in the fourth on Greg Garcia’s ground out and singles by Carlos Martinez and Tommy Pham. In the seventh, Paul DeJong’s 17th major league home run was the final Cardinals score. DeJong was 2-for-3, Fowler was 2-for-4. Grichuk was 2-for-4 with two runs scored. Starter Carlos Martinez earned his ninth win, pitching six innings, and giving up three runs on seven hits. The righty fanned seven and walked one. Tyler Lyons followed with two scoreless frames of relief. Trevor Rosenthal gave up two runs in the ninth, but earned his 11th save. In the field, Matt Carpenter made a missed catch error in the ninth that made matters tense. It was his 11th error of the season. The Cardinals were unable to complete the sweep against the Braves on Sunday as Michael Wacha did not have a good start. Wacha pitched five innings, giving up four runs on eight hits. The right hander struck out one and walked one in his fifth loss. Sam Tuivailala tossed two innings of relief and surrendered one run on two hits. Brett Cecil pitched a scoreless eighth. John Brebbia took the ninth and relinquished one run. Paul DeJong hit his 18th home run for St. Louis, a solo shot. DeJong was 3-for-5. Carson Kelly singled in a run in the seventh inning. Kolten Wong’s single in the eighth plated the third and final run for St. Louis. Wong and Randal Grichuk went 2-for-4. Tommy Pham was picked off first base. The Cardinals went 6-1 this past week, and had an eight game winning streak going back to last Saturday’s game against the Reds. The streak was broken with the loss to the Braves on Sunday. The winning streak moved the Cardinals into a virtual tie with the Cubs as of Saturday. With the loss on Sunday and the Cubs and Brewers winning, the Cardinals are now one game back of the Cubs, and one game ahead of the Brewers. The offense was outstanding the past week, scoring 49 runs in seven games. Other than a poor outing by Brett Cecil, the bullpen has been good. The defense has been fine, and there have been minor issues with baserunning. The starting pitching has been so-so but the offense made up for that. The team’s improved play could in part be tied back to a team meeting called by Yadier Molina and Adam Wainwright in Cincinnati on August 3. The Cardinals play the Red Sox and the Pirates on the road in the coming week, and how the Cardinals fare against both teams will be telling. Dexter Fowler is batting .421 with an OPS of 1.502. He has 1 HR, 1 triple, 4 doubles, and 6 RBI. Kolten Wong is batting .455 with an OPS of 1.261. He has 1 HR, 3 doubles, and 7 RBI. 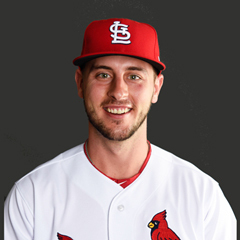 Paul DeJong is batting .387 with an OPS of 1.119. He has 2 HRs, 3 doubles, and 7 RBI. Randal Grichuk is batting .357 with an OPS of 1.107. He has 2 HRs, 1 triple, 3 doubles, and 7 RBI. Matt Carpenter is batting .360 with an OPS of 1.195. He has 1 HR, 1 triple, 3 doubles, and 8 RBI. Trevor Rosenthal has an ERA of 0.00 and a WHIP of 1.50. Matt Bowman has an ERA of 0.00 and a WHIP of 0.90. Luke Voit is batting .143 and has an OPS of .536. Mike Leake has an ERA of 7.20 and a WHIP of 2.40. Brett Cecil has an ERA of 13.50 and a WHIP of 2.25. Sam Tuivailala has an ERA of 9.00 and a WHIP of 1.00. The number 2 hitter has been Tommy Pham for 6 games and Jose Martinez for one game. The number 4 hitter has been Dexter Fowler for four games, and Martinez for three games. The number 5 hitter has been Yadier Molina. The number 6 hitter has been Fowler for two games, Kolten Wong for two games, Jedd Gyorko for two games, and Martinez for one game. The number 7 hitter has Wong for four games, Randal Grichuk for two games, and Gyorko for one game. The number 8 hitter has been Grichuk for three games, Greg Garcia for three games, and Wong for one game. 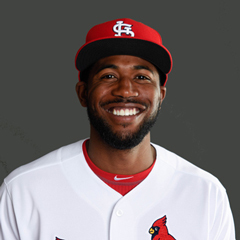 8/17 The Cardinals activated OF Dexter Fowler from the 10 day disabled list. 8/17 The Cardinals optioned OF Stephen Piscotty to the Memphis Redbirds. LHP Kevin Siegrist remains on the 10-day DL with left forearm tendinitis. Siegrist is doing strength work with trainers, but the timing of his expected return to the roster is unknown. 3B Jedd Gyorko was a late scratch to the lineup in Saturday’s game against the Braves. Gyorko is dealing with a sore right knee and sat out Sunday as well. Gyorko is considered day to day. The Cardinals have an off day Monday and travel to Boston to play the second half of a home and home series with the Red Sox. Mike Leake is scheduled to make the Tuesday start. The Wednesday starter will be Lance Lynn. The Cardinals travel to Pittsburgh for a four game series with the Pirates opening on Thursday. Monday, August 21 is an off day, and the Cardinals head home to begin a homestand, starting with a three game series against the Padres. The Cardinals then play a weekend series with the Tampa Bay Rays. Monday, August 28 is another off day, and the Cardinals travel to Milwaukee to play two games with the Brewers. The Cardinals then travel to San Francisco for a four game sets against the Giants. The Cardinals leave San Francisco and travel to San Diego to play a four game series against the Padres. The 1987 World Champion Cardinals were celebrated this weekend at Busch Stadium. I have talked a little about that team in the past, but let’s look at some tidbits about that squad in this week’s history segment. The 1987 Cardinals were managed by Whitey Herzog, who had also managed the previous World Champion Cardinals in 1982. The 1987 GM was former Cardinals shortstop Dal Maxvill. The 1987 squad finished with a record of 95-67 and with the division title in the National League East. It was the last season the Cardinals finished in first place before moving to the National League Central in 1994. The 1987 season included the Tommy Herr walk off grand slam on “Seat Cushion Night”. The team went into the post season without cleanup hitter Jack Clark, who had injured his ankle on the Astroturf at Montreal’s Olympic Stadium. Notable players on the 1987 team were Hall of Fame shortstop Ozzie Smith, fan favorite Willie McGee, and the aforementioned Jack Clark. Also on the 1987 roster was former pitcher and Fox Sports Midwest color analyst Ricky Horton, and former Cardinals third base coach Jose Oquendo. The regular starters were Smith, McGee, Clark, Terry Pendleton, Tommy Herr, Vince Coleman, Curt Ford, and catcher Tony Pena. In the book of weird names, this team also had a bench infielder named Skeeter Barnes. The 1987 Cardinals won the Division, and defeated the San Francisco Giants in the NLCS 4-3 (there was no NLDS in 1987, it was not implemented until 1995). St. Louis was defeated in the World Series 4-3 by the Minnesota Twins. The Cardinals were as successful as they were despite no starting pitcher winning more than 11 games during the season. The 1987 World Series was the first series in which both teams won only their home games. Three Cardinals on the 1987 team won awards in the offseason. Pendleton was awarded the National League Gold Glove at third base. Smith won the National League Gold Glove at shortstop and the Silver Slugger at shortstop. Clark was the National League Silver Slugger winner at first base. After the 1987 World Series, the Cardinals did not reach another World Series until 2004.